Starting in the 1980s, Alaska's Columbia Glacier began retreating, shrinking from 41 miles long (its originally documented length in 1794) to 36 miles long in 1995. This is what that change actually looks like from space. The images are part of the Timelapse project from Google and TIME, what Google calls "the most comprehensive picture of our changing planet ever made available to the public." It comes from a collection of images taken between 1984 and 2012 as part of the Landsat program, a joint satellite mission between NASA and U.S. Geological Survey that has been snapping pics of Earth's surface since the early '70s. 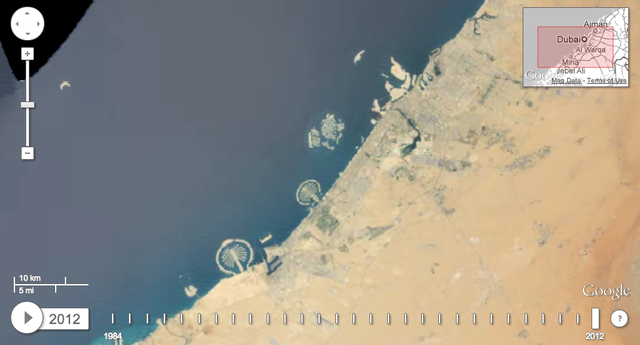 Google Earth sifted through more than 2 million images to find the clearest photos of every place on Earth, and created a browsable HTML5 animation for the whole world, with one image for every year since 1984.